Choosing the perfect funeral flowers for your loved one can be tricky, especially if you don’t know much about flowers or what they represent. Many of our customers ask us to design a traditional funeral wreath for their loved one’s service, and then change their mind when we explain the many other options available. However, a funeral wreath is a wonderful expression of love and affection for someone you care for and signifies the never-ending circle of life, and in many religions symbolises the afterlife too. So it may well be the perfect option for your loved one, but if you’re not sure, feel free to give us a call on 020 3409 3030 and we’ll happily discuss all the options with you. Sometimes people are put off from choosing a traditional funeral wreath for their floral tribute because they don’t understand how flexible and personal they can be. 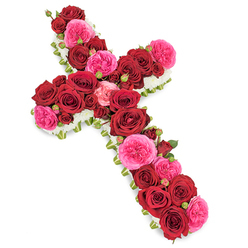 At Handy Flowers our florists take pride in being able to design funeral wreaths that are truly fitting for the person they are paying tribute to. So if you believe a wreath is the right choice, we will work with you to make sure that it really represents that special person who has passed away, using their favourite flowers, colours, and symbols of their life. Just call 020 3409 3030 to learn more. Picking flowers for funerals can be a stressful and distressing experience for many people. It can serve as one more reminder that the person you love is no longer present. Our florists are highly sensitive to your feelings at such a difficult time and make it a priority to offer full and complete support to you throughout the process. This may mean practical support in helping you choose the right funeral wreath or floral display, or spending time helping you select the perfect colours for it. But most importantly, they will respect your needs at this time, so whether you want a lot of support, or just some quick advice or a chat, they are always available to lend an ear and some expertise. We know that there is a lot to do to plan a fitting funeral service for someone who has died. In fact, it can begin to seem quite overwhelming once you realise just how much there is to do. But let us take one of these important tasks off your hands: Handy Flowers can not only help you choose the right floral tribute and design it for you, but we can also send funeral flowers for you wherever they need to go. 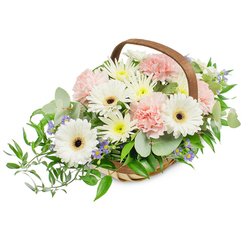 Whether that is a sympathy bouquet for the family or a traditional funeral wreath for the casket, we will send your flowers to any location in London, so you don’t have to worry about it for a second. At Handy Flowers our florists know that sometimes things go awry, but that’s the last thing you need when planning a funeral or ordering funeral flowers. So if you need last minute flowers for funerals, our talented florists are on hand to help. 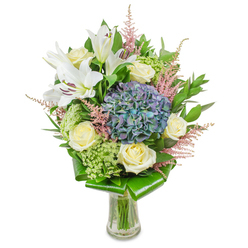 Or if you’d like to send sympathy flowers having just learned about a loss, we are able to support you with that too. We have a team of experts who can work around the clock to make sure that you have access to quality funeral flowers on demand because some things just can’t wait. 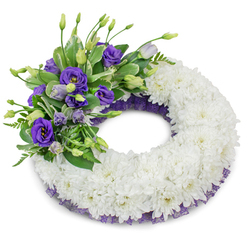 A funeral wreath is one of the most common floral tributes that we are asked to create. And it’s no wonder, wreaths are a wonderful symbol of everlasting life, and are a time-honoured way to show respect for the deceased. And with an expert florist from our team on hand, we can also make your funeral wreath truly personal to the individual you are paying tribute to. Why not visit our online flower shop or give us a call on 020 3409 3030 to tell us all about your loved one and we’ll help you design something they would love. In an ideal world, money should never be a factor when it comes to deciding how best to honour a loved one who has passed away. But sadly funerals and all the things that come with it do cost money. That is why we are committed to providing our customers with honestly affordable funeral flowers that suit every budget. Whether you just want something small and subtle, or bold and exotic, we have a range of affordable funeral flower options to suit all budgets and preferences. We promise we will find the best way to pay tribute to your loved one with a floral arrangement you can afford. Plus we offer discounts too to help lower the cost and reduce worries even more. To have fresh funeral flowers delivered fast, place an order now! 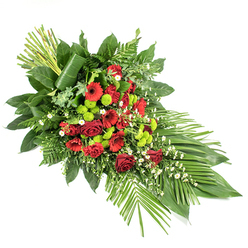 Whether your original funeral flowers haven’t turned up or you just decided on a whim to send funeral flowers last minute, our same day funeral flower delivery service is the ideal solution. 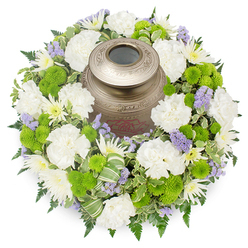 We have a range of top-class funeral flowers and wreaths available at short notice which can be sent to the funeral service on the day. 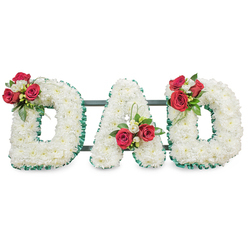 From wreaths for funerals to letter tributes, we can deliver it all on the same day of your order. Contact us to find out more!